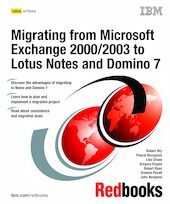 This IBM Redbooks publication presents the strategic and market benefits of IBM Lotus Domino over Microsoft Exchange and provides an overview of the tools and strategies that are available to help you with that migration. It also includes instructions for how to perform the migration process. The beginning of the book explores common business drivers, considerations, benefits, and scenarios that organizations find themselves in when faced with a migration decision, such as migrating from Exchange to Lotus Domino. The remainder of the book discusses the architectural planning and technical activities associated with that migration decision. For business or IT managers, the strategic portion of this book provides essential information about the what and why of migration. The remainder of the book focuses on the how of migration and the how of coexistence strategies. This book gives you the confidence that your organization can achieve the results you expect--and deserve--from the migration process from Exchange to Domino.